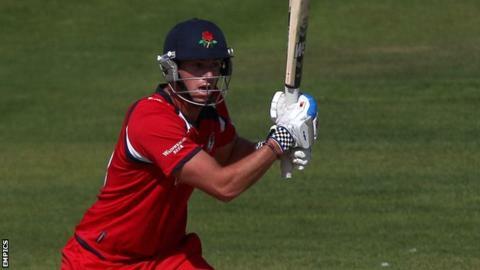 Lancashire batsman Jordan Clark has become the first Englishman - and only the fifth player in professional cricket - to hit six sixes in an over. The 22-year-old's achievement came in a second XI game against Yorkshire at Scarborough, off left-arm spinner Gurham Randhawa. West Indies legend Sir Garfield Sobers was the first to hit six sixes in an over for Nottinghamshire in 1968. Ravi Shastri, Herschelle Gibbs and Yuvraj Singh have repeated the feat. Clark joined Lancashire's academy in 2008 and, after making his one-day debut for the first team in 2010, he was part of the Second XI Trophy-winning side last season. The Whitehaven-born youngster is yet to make his County Championship debut for the Red Rose county, but has featured in five one-day and nine Twenty20 matches. He told BBC Sport: "I was batting against spin, the wicket wasn't a massive turner. I thought I needed to step it up a little bit. "I hit the first few pretty well, had a chat to my team-mate and I just carried on really." He added: "I put them all the same way, over leg. I thought he was going to try to mix it up, especially the last two balls but they just landed in the same spot. "I just remember feeling a bit of pressure on the last ball and thinking: 'I have got to have a crack'. "I just remember a lot of the lads were cheering and there was a lot of noise in the dressing room." Clark, who finished the day 70 not out to help Lancashire to a lead of 64 with five first-innings wickets remaining, hopes his feat can help him to cement a first XI place. He said: "Hopefully, six sixes is a massive bonus, trying to produce a big score was my main aim, hopefully it will turn a few heads." Sobers and Shastri's accomplishments came in domestic first-class cricket, the latter for Bombay. South Africa opener Gibbs's feat at the 2007 World Cup was the first time it had been achieved in international cricket, while India all-rounder Yuvraj joined the select group at the inaugural ICC World Twenty20 later that year - with England's Stuart Broad the unlucky bowler.